We at the PPCC once went to see a version of Shakespeare's Coriolanus which ended in a song-and-dance jig. For those of you who haven't yet seen Shakespeare's magnificently ridiculous gorefest, Coriolanus is so bloody that it's often been debated whether Will actually meant it to be a black comedy rather than a tragedy. People get baked into pies! And served to their parents! People lose limbs and tongues and sanity! Everyone goes bonkers and in the end everyone dies. The version we saw, which was generally excellent in balancing the ridiculous with the... well, more ridiculous, ended with all the actors (playing dead or no) suddenly jumping up and dancing a rousing Irish jig to some appeared-from-nowhere musicians. They wove their way through the audience. We clapped along. It was highly enjoyable. Tattoos. Diapers. What's not to love? Similarly, Zatoichi ends with an anachronist jig, except this time they tapdance to taiko drumming and the dead characters stay dead. But it's in the same vein of black comedy gorefest with moments of pure, hilarious surreality. No one gets baked into a pie, but there is transvestism, tillers who work their fields in time to Super Mario music, and much, much CGI blood. Our man Zatoichi lays the smackdown. In fact, let's mention the CGI blood for a minute, just to get it off our chest: CGI blood? CGI blood! What? Huh? We spent a lot of time going, "Bazzuh?" at the CGI blood. The swords were CGI too! They wobbled, they whoozed. Why not just turn them into lightsabers and be done with it? We did not like the CGI blood. Memoirs of a killer geisha! We did like the movie overall, though. As some background, Zatoichi is an iconic fictional character in Japan, Wikipedia likens him to James Bond in the US. He's a blind swordsmaster, this time played by Takeshi Kitano, who is very adept at just laying down the smack. The setting is Edo period Japan, and this episode in Zatoichi's eventful life of badassery takes place in a rural village in the grips of, surprise, a gang war. Yes, it's like Yojimbo. (In fact, fun fact, one of the Zatoichi movies is called Zatoichi versus Yojimbo and co-stars none other than our beloved Toshiro Mifune! The yojimbo himself!) Indeed, all the Kurosawa trademarks are there: the wandering ronin, the colorful cast of village characters, the perennial rain. 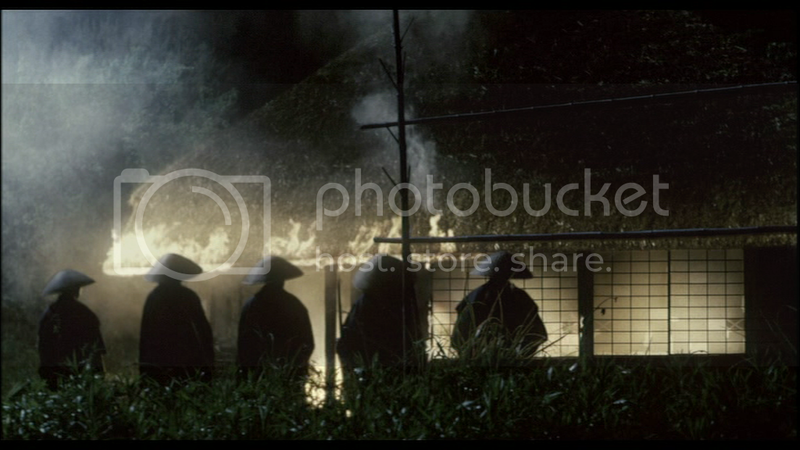 Except it's not Kurosawa, it's Takeshi Kitano (he directed and wrote and starred). The track that plays during this scene is so awesome. In this film, Zatoichi (Takeshi Kinato) rocks on up to a small town. He meets a nice middle-aged lady (Michiyo Ookusu) and stays with her for a while. She mentions she has a gambler nephew (Gadarukanaru Taka). We meet him, and he provides numerous moments of comic relief. Zatoichi and Gambler meet two lovely geishas (Daigorô Tachibana and Yuuko Daike), EXCEPT ONE OF THEM IS NOT A NICE GEISHA LADY BUT A MAN. They're actually a brother and sister assassin team on a mission to kill the gang who killed their family. We meet the various gangleaders. Our favorite was definitely the droopy-faced baritone Ginzo (Ittoku Kishibe), who was everything a villain should be and so much more. He was so awesome. Anyway, another wandering ronin (Tadanobu Asano) rocks up into town, bringing his consumptive wife in tow. To pay for the wife's medicine, he needs to get some yojimbo (bodyguard) work; he sides with the gangleaders. Do I smell a showdown coming? Why yes, I do. Imagery, oh imagery! 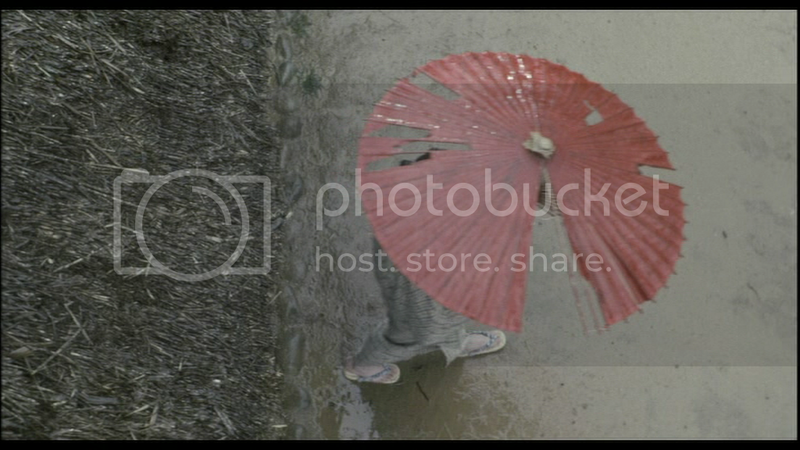 And Kurosawa's rain (c). 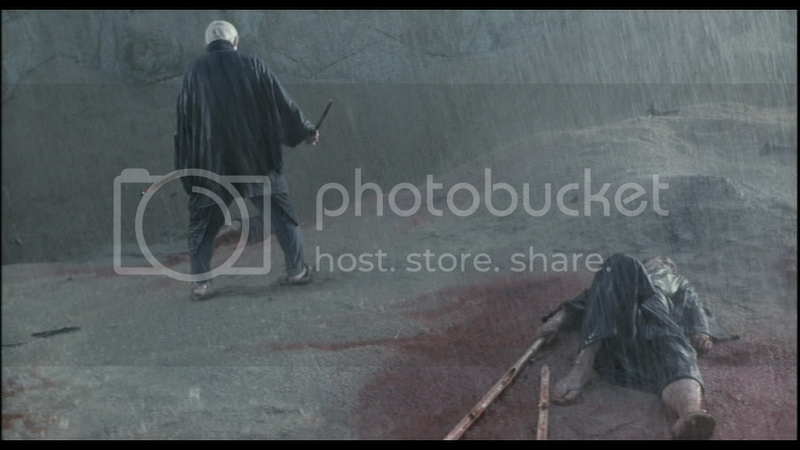 Takeshi Kitano's Zatoichi is a fascinating creature. Bent over and wizened, he's all coiled spine and tense, hand always hovering over his cane-sword (sword-cane?). He even has a facial tic! Excellent. 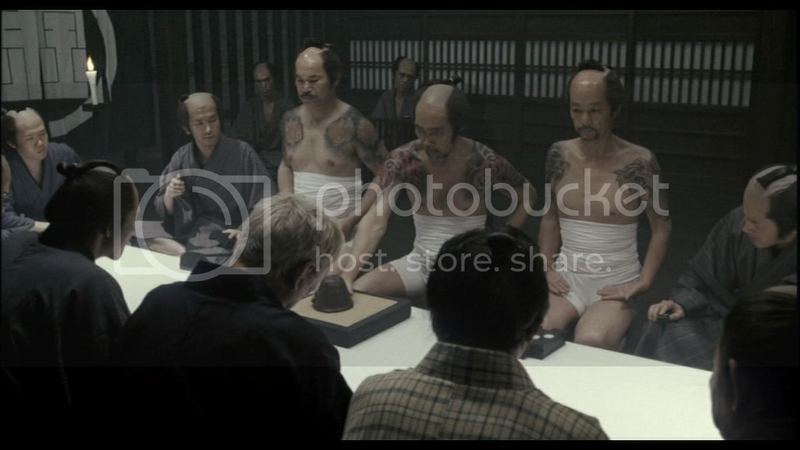 We already mentioned Ginzo the Yakuza Boss - totally awesome - and the rest of the cast was a lot of fun as well. Good, straightforward, meat and potatoes peformances. We want to also mention that the arch-nemesis ronin, played by Tadanobu Asano of Ichi the Killer fame, was hott with many Ts. 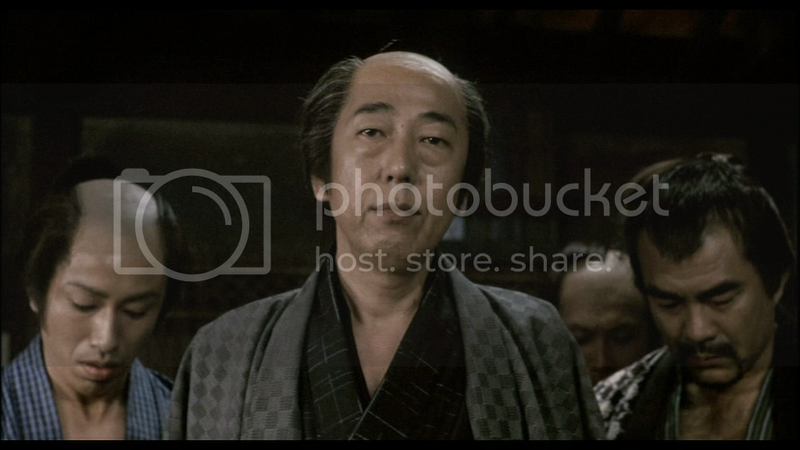 But what makes Zatoichi memorable is image and music. It's unexpectedly fun. The music was composed by Keiichi Suzuki, the same guy who composed the music to the original Super Mario Bros. Nintendo game (! ), and the soundtrack to this film ranges from traditional taiko drumming to synthesized video game melodrama. There are a number of scenes throughout the film when the extras begin to move in synch with the music; one scene in particular has tillers in the field serving as percussion for the Nintendo tunes behind. We at the PPCC absolutely loved this. Likewise, several aspects of the plot were surprisingly hard-hitting on the emotions. The brother and sister duo had quite a sob story, even if it was the same old sob story we've seen in every single gangster movie ever made. But we at the PPCC were touched nonetheless! Likewise, poor, extremely handsome arch-ronin - he just needed to buy his wife's medicine. Poor all of you. Yakuza! This guy was perfect. Overall, this movie's like a Nintendo game. You have to beat a number of minor bosses until you finally get to the last, big one, and then you stand by him with your fireball in hand, waiting for him to explain the plot to you in scrolling-text fashion. Princess Toadstool is just behind me, mwa ha ha. No, she's actually a frog! Oh my God, never saw that coming! The masons' sequence. En francais, s'il vous plait. Absolutely amazing film. One of my favourites which I am watching now :D.